West Melbourne Stadium was originally built by John Wren, the chairman of Stadiums Pty Ltd in 1915, and was the mecca for entrepreneurs’ entertainment ventures, which included numerous boxing, professional wrestling bouts and large meetings. To this day, Stadiums remains to be owned and run by the Wren family. The Stadium was tragically destroyed by fire in 1955, but was rebuilt in time for the 1956 Olympics Games, where it played host to the gymnastics and wrestling. 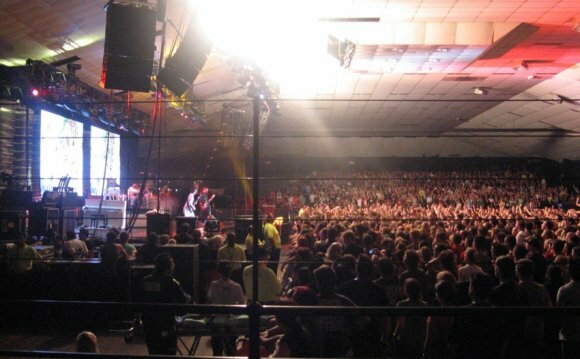 Since its reconstruction Festival Hall’s versatile set up has been utilized for many events. Festival Hall was known as the original House of Rock and Roll, and is famous for its electric atmosphere. From the pandemonium that greeted the Beatles, Bill Haley, Johnny Cash and the famous Lee Gordon “Big Shows”, through to the classic styles of Frank Sinatra, Liberace and Shirley Bassey. In more recent years, it has hosted artists such The Red Hot Chili Peppers, Justine Timberlake, Rage Against The Machine, Powderfinger, The Foo Fighters, The Script, Lily Allen, Ed Sheeran, and Lorde have all played to packed houses. Festival Hall has been referred to as the “House of Stoush”, with some of the greatest names in boxing fighting at Festival Hall. Among them are Lionel Rose, Johnny Fammachon, Anthony Mundine, Lester Ellis and Barry Michaels. Wrestling, roller derby, ballroom dancing, cultural and religious gatherings all became regular features, and the hall even hosted the First Indoor Tennis Exhibition featuring John McEnroe.